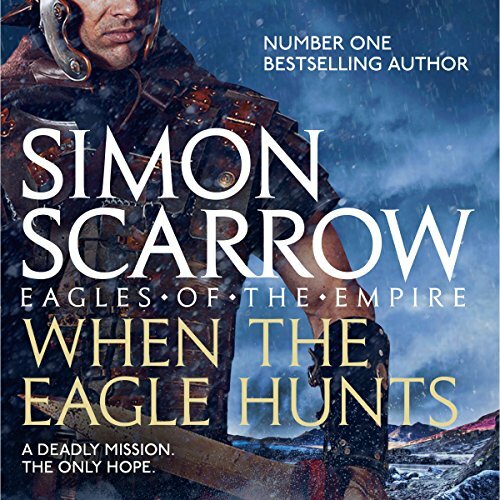 When the Eagle Hunts is the compelling third novel in Simon Scarrow's best-selling Eagles of the Empire series. For fans of Bernard Cornwell and Conn Iggulden. 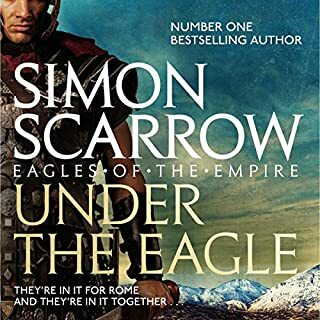 ©2002 Simon Scarrow (P)2013 Headline Publishing Group Ltd. This is the third book in the series. Audible did not have book two available. The year is 44 AD during the Roman invasion of Britain. This is a historical military novel about two soldiers Macro and Cato of the Roman Second Legion. A sudden storm strikes the Roman fleet bringing food, supplies, reinforcements and the wife, Lady Pomponia, and children of commanding General Plautus. The lead ship with Lady Pomponia aboard is driven off course before crashing against the rocks while attempting to beach the ship. The family is captured by the Druids. The Druids are attempting to exchange the General’s family for a number of captured Druids. Macro and Cato are sent to free the General’s family. The book is well written and the plot is strong. Scarrow has some dramatic battle scenes along with lots of action. A major battle is fought at Camulodunum or what is modern day Colchester. 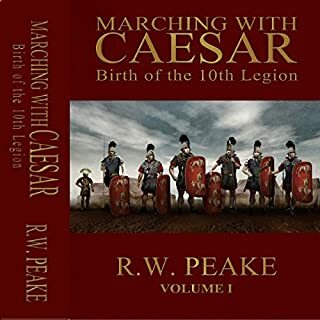 The author also provides insight into the soldier’s life in the Roman Legion. Scarrow also provides some information about Celtic culture and religion as well as information about the Druids. 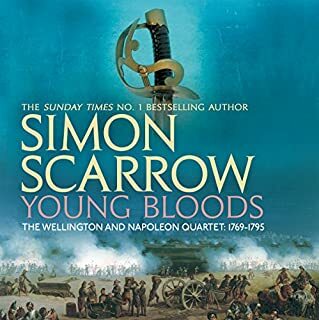 I am not an expert about this time frame in history so cannot say how accurate Scarrow is in the historical information. I did note two items, first, he said the ships had slave chained to the oars. I know this is inaccurate as the Roman’s only had free men on the oars of ships. The second item he gives the impression the Druids are a tribe and the Celts are a tribe. It is my understanding that the Druids were the educated class of the Celtic peoples not a separate tribe of people. The book is easy to read and is a real page turner. David Thorpe does an excellent job narrating the book. An excellent work. A novel with historical accuracy; as far as Roman adventures go.i just finished the book and I’m about to start it again. I wasn't so keen on the author when i started the series of books but he's grown on my and class him as one of my favourite narrators. I was sad to find he's not doing the subsequent books, so I doubt I will continue the series on Audible. The story itself is great though, so maybe i'll just buy the hardcopy. i read the books. so, i already was familiar with the writing. the narrator was a pleasant surprise. I thought he was truly more than one person his voice characters were so distinct. top notch narrator. buy the book for him even if Roman soldiers isn't your thing. To heck with Caesar, all hail Macro and Cato !! Another great performance of another great book. The story line for this 3rd novel isn’t quite up to par with the previous two, but is still good. 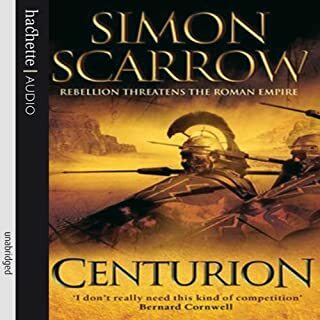 Simon Scarrow’s narration continues to greatly add to the audio version, and I certainly hope they don’t change narrators for follow on books. If you haven’t been introduced to this series, I might want to start with the first book. If you’ve finished books one and two, and are considering the third book, I recommend you do so. For a long time this review read "And here I'm stuck" as Audible was missing the next two books in the series. They have remedied the situation now meaning that anyone lucky enough to have not read this excellent series can now read straight through without interruption. Bravo Audible! 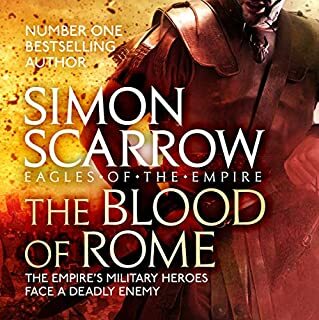 This is a fine series, Macro and Cato make a great pair and Simon Scarrow's excellent historical detail and fine story-telling coupled with David Thorpe's narration make an excellent set of ingredients and produce fine military history fiction. If you like the first two then you'll like this one! This is a very enjoyable story, particularly through its second listen. Well narrated by a reader who pitches the different characters well. My only criticism is that for me the reader’s mispronunciation of Cato’s name can be annoying, but overall, David Thorpe is an accomplished reader who brought the story to life. 3rd Book in the Eagle series. If you have made it this far then surely you are already hooked on the story of Makro and Cato and no doubt you will be looking forward to diving in to the next instalment. this is the 3rd story in the series i have listened to and i am really enjoying them. actors have grown on me. Can't recommend this book highly enough loved every minute thanks to the writer and the narrater. This author really has done well to have his stories follow through from book one to book three so well. perfectly set up and delivered. David Thorpe does an excellent job in all of his narrating in Eagles of the Empire. His character voices give the listener a visual image of the person. I look forward to more from him! Cato is an intelligent soft ex-imperial slave freed into the harsh life of the Roman military, it is his quick thought that wins out against the aggressive and brutal. It's great to follow this tale of friendship with a stereotypical bullish centurion and better still with this ending. Brilliant entry. A bit of a change but still a great listen. Can't wait to get through the next one in the series. What made the experience of listening to When the Eagle Hunts the most enjoyable? 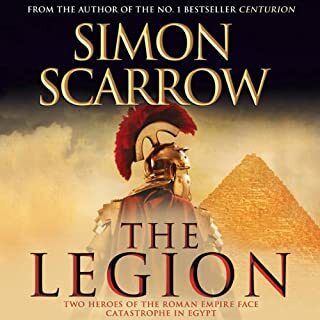 I love this series because Simon Scarrow has done a marvelous job of weaving fiction and truth together. You get the best of both worlds, entertainment and you get to learn a lot about the inner workings of the Roman Empire, the Legions which furthered the Roman ideal and were the backbone of all power in Rome and of course some great characters that you can follow and really get to know more and more as the stories develop! It made me laugh, it made me a little anxious but all in all I was glad to have my eyes opened to the world of Ancient Rome that much further.